OOSS joins ASCRS and AAO in releasing new specialty-specific guidelines for the sterile processing of ophthalmic surgical instruments. This document makes evidence-based recommendations regarding issues that may be unique to the cleaning and sterilization of intraocular instrumentation.The new guidelines are the product of a three-year collaboration of the three organizations and provides recommendations with the intent of assisting our members better understand, adopt, or defend certain well-established sterile processing practices as well as appropriately respond to surveyors and other regulators who challenge our facilities’ practices. 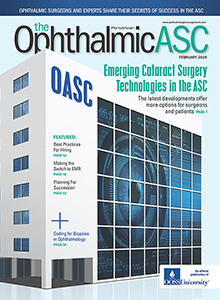 Because of increased scrutiny of longstanding sterilization processes in ophthalmology by The Joint Commission and CMS, as well as the heightened threat to licensure or coverage faced by ambulatory surgery centers (ASCs) over the past decade, the organizations created the Ophthalmic Instrument Cleaning & Sterilization (OICS) Task Force and worked together to educate various regulatory agencies that some broad general surgery requirements and guidelines are not necessarily appropriate for the cleaning and sterilization of ophthalmic instruments. Separate challenges came from The Joint Commission, which originally required a full terminal wrapped and dry cycle for sequential same-day cases, and from a CMS ruling that immediate use steam sterilization (IUSS) could not be performed routinely for any type of surgery. Additionally—and extremely problematic for ASCs performing anterior segment surgery—many CMS surveyors considered short sterilization cycles for cataract instruments to be IUSS. As a result of this joint task force effort, CMS clarified the acceptability of short-cycle sterilization for sequential same-day ophthalmic cases with certain constraints. However, there continued to be ambiguities in the interpretation of what was acceptable. For this reason, the task force designed a study of short-cycle sterilization with commonly used FDA-approved sterilizers identified by a survey of OOSS member facilities. Funded by ASCRS, OOSS, and the Academy, this study established the safety and acceptability of short-cycle ophthalmic instrument processing for sequential same-day surgery, even when the drying phase is interrupted, if allowed by the sterilizer’s instructions for use (IFU). If you need additional information or have any questions please contact our Washington Counsel, Michael Romansky, JD, at mromansky@ooss.org.